BB Company was founded in 2002. The main business of the company was concentrated on import of Italian coffee and the professional bar/kitchen appliances to Georgia. In 2015 BB Company opened its own factory and started the processing of Mondo coffee, establishing the implementation of the new standards of coffee consumption in Georgia as its main goal. BB Company is a member of numerous international coffee associations and organizations today. Another page to its history will be added in the nearest future by opening of a Mondo café-shop network where apart from buying tasty and diverse coffee, coffee aficionados will extend their passion beyond a cup of coffee in a good company of their friends. The high quality of Mondo coffee, apart from modern technologies, is ensured by high qualification of the professional team. Our company has implemented ISO22000 and HACCP standards in terms of food safety and security. Mondo is a distinguished member of the Speciality Coffee Association of Europe (SCAE) and the International Coffee Organization (ICO). Being part of these organizations means frequent meetings and trainings where the leading coffee processing companies discuss important news related to their products. Horeca – various blends of the premium quality Mondo coffee are offered to hotels, restaurants and cafés. All necessary equipment for making coffee, branded tableware, service and constant training makes Mondo an unrivaled and a reliable partner. Mondo quickly gathered a wide auditorium of coffee aficionados. The premium quality coffee beans with exceptional taste leave no one indifferent. At the same time, the elegant and exquisite packaging always attracts the attention of the consumers. We take care of your mood and create a pleasurable environment for you. Mondo coffee is an optimal choice for the customers of the large wholesale networks as by cooperating with us you will acquire a reliable partner. Wide range of different blends of Mondo coffee for wholesale trading will be provided and delivered in a special 10 kg packaging, that makes doing business with Mondo even more comfortable. It is well known that Italy has played a big role in the development of the coffee industry. 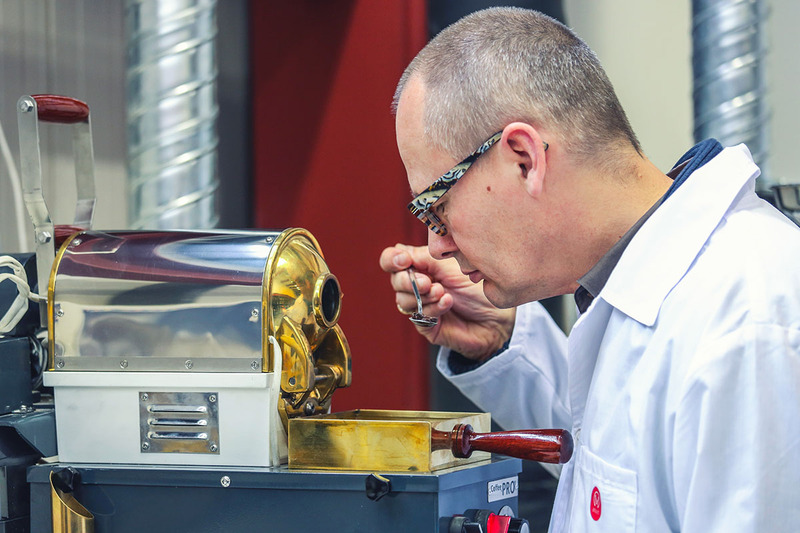 In order to implement their professional experience in Georgia, two of the largest Italian coffee laboratories are involved in creating the Mondo coffee recipes and aromas. By heeding traditions and using appropriate technologies we have created a diverse and high quality product with a unique taste – Mondo coffee processed in Georgia. The whole process of processing Mondo coffee is automatic. Raw coffee beans undergo an automatic and high-tech process immediately after entering the factory. Initially, green coffee beans are cleaned using a special device, roasted, cooled down and cleaned again. Afterwards, various sorts of coffee beans are mixed together creating a unique combination which then is grinded and made ready for packaging. It should be noted that Mondo coffee beans undergo a dual cleaning whilst the roasting regime is individually chosen taking the origins of coffee beans and the profile of the final product into account. An individual formula of coffee bean combination, hi-tech processing, the Italian tradition of roasting and the experienced technologists make this process highly unique. Apart from the roasting process, packaging materials also play an important role in preserving the individual taste and aroma of coffee. A special, Italian, three-layer coffee packaging material used for Mondo coffee fully preserves its original profile, taste and aroma.